Well it has been 6 months since I had my Gastric Sleeve surgery done. I am down 66 lbs. * I have spent the last 25 years of my life trying to figure out howI got so heavy and how to get it off. I have tried all the programs and pills with little to no luck at any significant weight loss. If I did loose a few pounds I put it right back on. I am 51 years old and never had a weight issue as a child it was after having my kids that the weight started adding up. I tried to get my insurance to approve the procedure but had no luck with that. My health was declining and I finally decided that I needed to do something or I was going to be in really bad shape soon. I already had arthritis and sleep apnea. I read about Belite on the Internet and requested a quote. The price quoted was a small fraction compared to what they quoted me here in Ohio. I knew that this would probably be my only option. They assigned me a patient facilitator that walked me through the whole process. It wasn't very long before I was on my way. I was met at the airport just as they said. From there it was on to the hospital. The driver took us straight to the hospital and hand delivered us to the correct people. After completing the check in process the pre-surgical testing began. It was only a couple of hours until the actual surgery. I had no trouble at all. They were very helpful and everything was done just as they had explained. They even sent me home with a surgical report and X-rays of my new sleeve. The hospital was pretty new and very clean. It is just like the pictures you see on line. I want to loose a total of 100 lbs so I still have 33 more to go but I am sure I can do it. I have had no problems since the procedure was done on 4-14-2010. I can't tell you how much better I feel and everyone of course says that I look a lot better. It has been fun going out and purchasing new clothes because the others are way too big...I feel like a new woman and my husband says I look like a new woman as well. 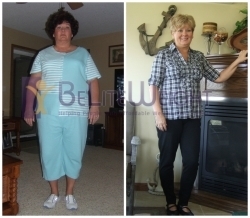 I would recommend anyone considering weight loss surgery to contact BeLiteWeight and just go for it. Life is too short to spend it being unhappy or unhealthy, especially if you can do something to make it better.